~A man may die, nations may rise and fall, but an idea lives on. Killing is the worst human tragedy. People, over the last 63 years for the quest of independence have practiced different tactics and strategies, thereby continuing the struggle in different phases and manners.However,any solution is still elusive. Kashmir's misfortunes do not end here.India and Pakistan both have their own reasons to seek accession of Jammu-Kashmir to their country.The ideological divergences of Chowdary Abbas and Sheikh Abdullah has faced a popular rebellion for a genuine reason. Those who are trying to project the present struggle as religious one are deliberately trying to confuse the issue. Their aim is very clear - they don't want the issue to be resolved. It is clear to everyone that by projecting the Kashmiri struggle as religious(which is known as "Islamic fundamentalist struggle"), they are only trying to deprive it from desperately needed internal and external support. Also by projecting it as a so called fundamentalist or extremist religious movement, an attempt is being made to frighten off the non Muslims of Kashmir. Already a lot of damage has been done to the social and community harmony, and such attempts are made to ensure that the minorities of Kashmir remain divided. 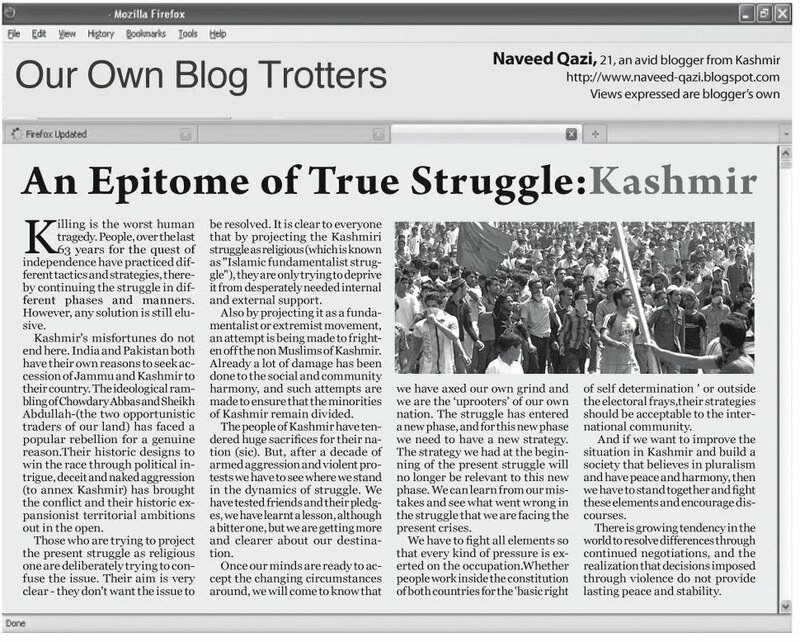 The people of Kashmir have rendered epitome sacrifices for their nation. But, after a decade of armed aggression and violent protests we have to see where we stand in the dynamics of struggle.We have tested friends and their pledges,we have learnt a lesson,although a bitter one, but we are getting more and more clear about our destination. Once our minds are ready to accept the changing circumstances around,we will come to know that we have axed our own grind and we are the uprooters of our own nation.The struggle has entered into a new phase, and for this new phase we need to have a new strategy. The strategy we had at the beginning of the present struggle will on longer be relevant to this new phase. We can learn from our mistakes and see what went wrong in the struggle that we are facing the present crises. We have to fight all elements so that every kind of pressure is exerted on the occupation.Whether people work inside the constitution of both countries for the 'basic right of self determination ' or outside the electoral frays, their strategies should be acceptable to the international community. 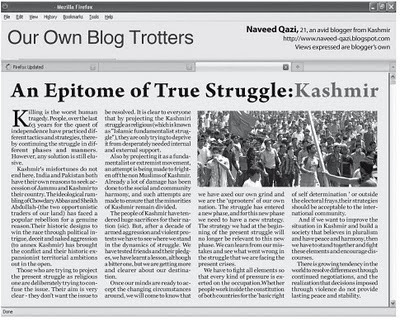 Those who are trying to confuse the issue at this juncture, and are trying to deprive the genuine Kashmiri struggle of internal and external support by projecting it as extremist, are not friends of the people. And if we want to improve the situation in Kashmir and build a society that believes in pluralism and have peace and harmony, then we have to stand together and fight these elements and encourage discourses. There is growing tendency in the world to resolve, differences through continued negotiations, and the realization that decisions imposed through violence do not provide lasting peace and stability.